This invention relates to a method of saccharifying lignocellulosic material, the method comprising: providing in a vessel, a slurry comprising a lignocellulosic material, water, and an enzyme, the slurry having greater than 20 weight percent solids; and drawing slurry material from the vessel and jetting the slurry material into the vessel, while saccharifying at least a portion of the lignocellulosic material, producing a sugar. This application claims priority to U.S. Provisional Application Serial No. 61/179,995, filed May 20, 2009 , and U.S. Provisional Application Serial No. 61/218,832, filed June 19, 2009 . The complete disclosure of each of these provisional applications is hereby incorporated by reference herein. Various cellulosic and lignocellulosic materials, their uses, and applications have been described in U.S. Patent Nos. 7,307,108 , 7,074,918 , 6,448,307 , 6,258,876 , 6,207,729 , 5,973,035 and 5,952,105 ; and in various patent applications, including "FIBROUS MATERIALS AND COMPOSITES," PCT/US2006/010648, filed on March 23, 2006 , AND "FIBROUS MATERIALS AND COMPOSITES," U.S. Patent Application Publication No. 2007/0045456 . Generally, this invention relates to processes for saccharifying or liquifying a material, e.g., a cellulosic or lignocellulosic feedstock, by converting the cellulosic portion of the material to low molecular weight sugars, e.g., using an enzyme. The invention also relates to converting a feedstock to a product, e.g., by fermentation. The processes disclosed herein can utilize low bulk density materials, for example cellulosic or lignocellulosic feedstocks that have been physically pretreated to have a bulk density of less than about 0.5 g/cm3, e.g., less than about 0.35 g/cm3, 0.25 g/cm3, 0.20 g/cm3, 0.15 g/cm3, 0.10 g/cm3, 0.05 g/cm3 or less, e.g., 0.025 g/cm3. Such materials can be especially difficult to mix with liquids, e.g., with water or a solvent system for saccharification, fermentation, or other processing. Due to their low bulk density, the materials tend to float to the surface of the liquid rather than being dispersed therein. In some cases, the materials can be hydrophobic, highly crystalline, or otherwise difficult to wet. At the same time, it is desirable to process the feedstock in a relatively high solids level dispersion, in order to obtain a high final concentration of sugar in the saccharified material, or a high concentration of the desired product after processing (e.g., of ethanol or other alcohol(s) after fermentation). In some cases, utilizing the methods described herein the solids level of the dispersion during processing can be, for example, at least 20, 25, 30, 35, 40, 45, or even at least 50 percent by weight dissolved solids. The inventors have found that dispersion of a feedstock in a liquid mixture can be enhanced, and as a result the solids level of the mixture can be increased, by the use of certain mixing techniques and equipment. The mixing techniques and equipment disclosed herein also enhance mass transfer, and as a result reaction rates in a mixture, and avoid or minimize harm to sensitive ingredients of the mixture such as microorganisms and enzymes. In particular, jet mixing techniques, including for example jet aeration and jet flow agitation, have been found to provide good wetting, dispersion and mechanical disruption. By increasing the solids level of the mixture, the process can proceed more rapidly, more efficiently and more cost-effectively, and the resulting concentration of the final product can be increased. Some of the processes disclosed herein include saccharification of a feedstock, and transportation of the feedstock from a remote location, e.g., where the feedstock is produced or stored, to the manufacturing facility. In some cases, saccharification can take place partially or entirely during transport. In such cases, it can be advantageous to provide mixing, e.g., jet mixing, in the transport vessel. In some cases, saccharification can be completed during transport. In some instances, fermentation can take place partially or entirely during transport. In some implementations, the process further includes reducing the recalcitrance of a feedstock, before or during saccharification. The process may include the further steps of measuring the lignin content of the feedstock and determining whether pretreatment is needed and under what conditions based on the measured lignin content. In one aspect, the invention features a method that includes saccharifying a biomass feedstock by mixing the feedstock with a liquid medium and a saccharifying agent in a vessel, using a jet mixer. Some embodiments include one or more of the following features. The feedstock can have a bulk density of less than about 0.5 g/cm3. The feedstock may be, for example, a cellulosic or lignocellulosic material. The liquid can include water. The saccharifying agent can include an enzyme. The jet mixer may include, for example, a jet-flow agitator, a jet aeration type mixer, or a suction chamber jet mixer. If a jet aeration type mixer is used, it may be used without injection of air through the jet mixer. For example, if the jet aeration type mixer includes a nozzle having a first inlet line and a second inlet line, in some cases both inlet lines are supplied with a liquid. In some cases, mixing comprises adding the feedstock to the liquid medium in increments and mixing between additions. The method may further include monitoring the glucose level of the mixture of feedstock, liquid medium and saccharifying agent during mixing, and in some cases adding additional feedstock and saccharifying agent to the vessel during saccharification. The mixing vessel may be, for example, a tank, rail car or tanker truck. Saccharification can in some cases take place partially or completely during transport of the mixture of feedstock, liquid medium and saccharifying agent. The method may further include adding an emulsifier or surfactant to the mixture in the vessel. In another aspect, the invention features saccharifying a biomass feedstock by mixing the feedstock with a liquid medium and a saccharifying agent in a vessel, using a mixer that produces generally toroidal flow within the vessel. In some embodiments, the mixer is configured to limit any increase in the overall temperature of the liquid medium to less than 5°C over the course of mixing. This aspect may also include, in some embodiments, any of the features discussed above. In yet a further aspect, the invention features a method that includes converting a low molecular weight sugar to a product by mixing the low molecular weight sugar with a microorganism in a liquid medium, using a jet mixer. Some embodiments include one or more of the following features. The liquid medium can include water. The microorganism can include yeast. The jet mixer can include a jet-flow agitator, jet aeration type mixer, or suction chamber jet mixer. In another aspect, the invention features an apparatus that includes a tank, a jet mixer having a nozzle disposed within the tank, a delivery device configured to deliver a biomass feedstock to the tank, and a delivery device configured to deliver a metered amount of a saccharifying agent to the tank. Some embodiments include one or more of the following features. The jet mixer can further include a motor, and the apparatus can further include a device configured to monitor the torque on the motor during mixing. The apparatus can also include a controller that adjusts the operation of the feedstock delivery device and/or the saccharifying agent delivery device based on input from the torque-monitoring device. The invention also features a method that includes saccharifying a biomass feedstock in a vessel to form a saccharified mixture; inoculating the saccharified mixture in the vessel with a microorganism; and allowing the inoculated saccharified mixture to ferment in the vessel. In some cases, the contents of the vessel are transferred to a transport vessel during fermentation and fermentation continues in the transport vessel. The method may further include agitating the contents of the vessel with a jet mixer during saccharification and fermentation. In some embodiments, the method further includes monitoring the oxygen content and ethanol and/or sugar content of the fermenting mixture. In another aspect, the invention features a fermentation system that includes a vessel having a vent; a source of oxygen in communication with the vessel; an oxygen monitor configured to monitor the oxygen content of a liquid in the vessel; and a controller configured to adjust the oxygen content of the liquid, using the vent and oxygen source, in response to input from the oxygen monitor. The flow rate of oxygen into the vessel, if oxygenation is required, can be relatively low. For example, the controller may be configured to oxygenate the vessel at a rate of less than 0.2 vvm, e.g., less than 0.1, 0.05, 0.025, or even less than 0.01 vvm. The fermentation system may further include a fermentation monitor configured to monitor the sugar concentration and/or ethanol concentration of the liquid in the vessel; and a controller configured to stop fermentation based on input received from the fermentation monitor. In some cases, the system includes a fermentation stopping module configured to stop fermentation in response to a signal received from the controller. FIG. 2 is a flow diagram illustrating conversion of a feedstock to ethanol via production and transport of a glucose solution. FIG. 2A is a diagrammatic illustration of a saccharification system according to one embodiment. FIGS. 4 and 4A are diagrams illustrating jet flow exiting a nozzle. FIG. 5 is a diagrammatic perspective view of a jet-flow agitator according to one embodiment. FIG. 5A is an enlarged perspective view of the impeller and jet tube of the jet-flow agitator of FIG. 5. FIG. 5B is an enlarged perspective view of an alternate impeller. FIG. 6 is a diagram of a suction chamber jet mixing nozzle according to one embodiment. FIG. 6A is a perspective view of a suction chamber jet mixing system according to another embodiment. FIG. 7 is a diagrammatic perspective view of a jet mixing nozzle for a suction chamber jet mixing system according to another alternate embodiment. FIG. 8 is a diagrammatic perspective view of a tank and a jet aeration type mixing system positioned in the tank, with the tank being shown as transparent to allow the jet mixer and associated piping to be seen. FIG. 8A is a perspective view of the jet mixer used in the jet aeration system of FIG. 8. FIG. 8B is a diagrammatic perspective view of a similar system in which an air intake is provided. FIG. 9 is a cross-sectional view of a jet aeration type mixer according to one embodiment. FIG. 10 is a cross-sectional view of a jet aeration type mixer according to an alternate embodiment. FIGS. 11-13 are diagrams illustrating alternative flow patterns in tanks containing different configurations of jet mixers. FIG. 14 is a diagram illustrating the flow pattern that occurs in a tank during backflushing according to one embodiment. FIGS. 15 and 15A show a tanker truck and a rail car, respectively, set up for intransit mixing using a pulsed air portable mixing system. FIGS. 16 and 16A are perspective views of two embodiments of mixing heads used in a mixer according to an alternate embodiment. FIG. 17 is a side view of a jet aeration type system according to another embodiment, showing a multi-level arrangement of nozzles in a tank. FIGS. 18 and 18A are a diagrammatic top view and a perspective view, respectively, of a device that minimizes hold up along the walls of a tank during mixing. FIGS. 19, 20, and 21-21A are views of various water jet devices that provide mixing while also minimizing hold up along the tank walls. FIG. 22 is a cross-sectional view of a tank having a domed bottom and two jet mixers extending into the tank from above. Using the methods described herein, biomass (e.g., plant biomass, animal biomass, and municipal waste biomass) can be processed to produce useful intermediates and products such as those described herein. Systems and processes are described herein that can use as feedstock materials cellulosic and/or lignocellulosic materials that are readily available, but can be difficult to process by processes such as fermentation. Many of the processes described herein can effectively lower the recalcitrance level of the feedstock, making it easier to process, such as by bioprocessing (e.g., with any microorganism described herein, such as a homoacetogen or a heteroacetogen, and/or any enzyme described herein), thermal processing (e.g., gasification or pyrolysis) or chemical methods (e.g., acid hydrolysis or oxidation). Biomass feedstock can be treated or processed using one or more of any of the methods described herein, such as mechanical treatment, chemical treatment, radiation, sonication, oxidation, pyrolysis or steam explosion. The various treatment systems and methods can be used in combinations of two, three, or even four or more of these technologies or others described herein and elsewhere. The processes disclosed herein can utilize low bulk density materials, for example cellulosic or lignocellulosic feedstocks that have been physically pretreated to have a bulk density of less than about 0.5 g/cm3, e.g., less than about 0.35 g/cm3, 0.25 g/cm3, 0.20 g/cm3, 0.15 g/cm3, 0.10 g/cm3, 0.05 g/cm3 or less, e.g., 0.025 g/cm3. Bulk density is determined using ASTM D1895B. Briefly, the method involves filling a measuring cylinder of known volume with a sample and obtaining a weight of the sample. The bulk density is calculated by dividing the weight of the sample in grams by the known volume of the cylinder in cubic centimeters. The materials that include cellulose can be treated with the saccharifying agent by combining the material and the saccharifying agent in a liquid medium, e.g., a solvent such as an aqueous solution. The saccharifying agent, material and liquid medium are mixed thoroughly, using one or more mixers having the mixing characteristics described herein, e.g., one or more jet mixers. In some implementations, the material and/or the saccharifying agent are added incrementally rather than all at once. For example, a portion of the material can be added to the liquid medium and mixed with the saccharifying agent until the material is at least partially saccharified, at which point a second portion of the material is added to the mixture. This process can continue until a desired sugar concentration is obtained. The saccharification process can be partially or completely performed (a) in a tank (e.g., a tank having a volume of at least 4000, 40,000, 400,000, 4,000,000 or 40,000,000 L) in a manufacturing plant, and/or (b) in transit, e.g., in a rail car, tanker truck, or in a supertanker or the hold of a ship. The time required for complete saccharification will depend on the process conditions and the feedstock and enzyme used. If saccharification is performed in a manufacturing plant under controlled conditions, the cellulose may be substantially entirely converted to glucose in about 12-96 hours. If saccharification is performed partially or completely in transit, saccharification may take longer. It is generally preferred that the final concentration of glucose in the sugar solution be relatively high, e.g., greater than 15%, or greater than 20, 30, 40, 50, 60, 70, 80, 90 or even greater than 95% by weight. This reduces the volume to be shipped, and also inhibits microbial growth in the solution. After saccharification, the volume of water can be reduced , e.g., by evaporation or distillation. A relatively high concentration solution can be obtained by limiting the amount of water added to the feedstock with the enzyme. The concentration can also be controlled by controlling how much saccharification takes place. For example, concentration can be increased by adding more feedstock to the solution. Solubility of the feedstock in the medium can be increased, for example, by increasing the temperature of the solution, and/or by adding a surfactant as will be discussed below. For example, the solution can be maintained at a temperature of 40-50°C, 50-60°C, 60-80°C, or even higher. Referring to FIG. 2, a process for manufacturing an alcohol, e.g., ethanol, can include, for example, optionally physically pre-treating the feedstock, e.g., to reduce its size (step 110), before and/or after this treatment, optionally treating the feedstock to reduce its recalcitrance (step 112), and saccharifying the feedstock to form a sugar solution (step 114). Saccharification can be performed by mixing a dispersion of the feedstock in a liquid medium, e.g., water, with an enzyme (step 111), as will be discussed in detail below. During or after saccharification, the mixture (if saccharification is to be partially or completely performed en route) or solution can be transported, e.g., by pipeline, railcar, truck or barge, to a manufacturing plant (step 116). At the plant, the solution can be bio-processed to produce a desired product, e.g., ethanol (step 118), which is then processed further, e.g., by distillation (step 120). The individual steps of this process will be described in detail below. If desired, the steps of measuring lignin content (step 122) and setting or adjusting process parameters (step 124) can be performed at various stages of the process, for example just prior to the process step(s) used to change the structure of the feedstock, as shown. If these steps are included, the process parameters are adjusted to compensate for variability in the lignin content of the feedstock, as described in U.S. Provisional Application Number 61/151,724, filed on February 11, 2009 , the complete disclosure of which is incorporated herein by reference. The mixing step 111 and saccharifying step 114 can be performed using, for example, the system shown in FIG. 2A. This system includes a conveyor 130, which receives feedstock that has been treated to reduce its size and optionally to reduce its recalcitrance (steps 110 and 112 above) by a feedstock pretreatment module 132. The feedstock 134 is delivered to a tank 136, which contains a liquid medium 138, e.g., water, which is delivered to the tank through a valved piping system (not shown). A dispersing system may be used to facilitate initial dispersion of the feedstock into the liquid medium, e.g., as disclosed in U.S. Provisional Application No. 61/296,658, filed January 20, 2010 , the full disclosure of which is incorporated by reference herein. A saccharifying agent is delivered to the tank from a hopper 140, which includes a metering device 142. The contents of the tank are mixed by one or more jet mixers. A jet mixer 144 is represented diagrammatically in FIG. 2A; examples of suitable jet mixers will be described in detail below. The jet mixer produces a jet using a motor 146 that drives a pump and/or a rotor (not shown). The torque exerted by the motor 146 correlates with the solids level of the mixture in the tank, which in turn reflects the degree to which the mixture has saccharified. The torque is measured by a torque monitor 148, which sends a signal to a motor 150 that drives the conveyor 130 and also to the metering device 142 of the hopper 140. Thus, the supply of the treated feedstock and the enzyme can be interrupted and resumed as a function of the saccharification of the contents of the tank. The data measured by the torque monitor can also be used to adjust the jet mixer, e.g., to a lower RPM for a mixer that utilizes a rotor, or to a lower jet velocity for a pump-driven mixer. Instead of, or in addition to, the torque monitor, the system may include an Amp monitor (not shown) that measures the full load amperage of the motor. In some cases, the jet mixer may include a variable frequency drive (VFD) to allow the speed of the motor to be adjusted. In some cases, the manufacturing plant can be, for example, an existing grain-based or sugar-based ethanol plant or one that has been retrofitted by removing or decommissioning the equipment upstream from the bio-processing system (which in a typical ethanol plant generally includes grain receiving equipment, a hammermill, a slurry mixer, cooking equipment and liquefaction equipment). Thus, the feedstock received by the plant is input directly into the fermentation equipment. A retrofitted plant is shown schematically in FIG. 3. The use of an existing grain-based or sugar-based ethanol plant in this manner is described in U.S. Serial No. 12/704,521, filed February 11, 2010 , the full disclosure of which is incorporated herein by reference. In some embodiments, rather than transporting the saccharified feedstock (sugar solution) to a separate manufacturing plant, or even a separate tank, the sugar solution is inoculated and fermented in the same tank or other vessel used for saccharification. Fermentation can be completed in the same vessel, or can be started in this manner and then completed during transport as discussed above. Saccharifying and fermenting in a single tank are described in U.S. Provisional Application No. 61/296,673, filed January 20, 2010 , the full disclosure of which is incorporated herein by reference. Various types of mixing devices are described below, and other mixing devices may be used. Suitable mixers have in common that they produce high velocity circulating flow, for example flow in a toroidal or elliptical pattern. Generally, preferred mixers exhibit a high bulk flow rate. Preferred mixers provide this mixing action with relatively low energy consumption. It is also generally preferred that the mixer produce relatively low shear and avoid heating of the liquid medium, as shear and/or heat can deleteriously affect the saccharifying agent (or microorganism, e.g., in the case of fermentation). As will be discussed in detail below, some preferred mixers draw the mixture through an inlet into a mixing element, which may include a rotor or impeller, and then expel the mixture from the mixing element through an outlet nozzle. This circulating action, and the high velocity of the jet exiting the nozzle, assist in dispersing material that is floating on the surface of the liquid or material that has settled to the bottom of the tank, depending on the orientation of the mixing element. Mixing elements can be positioned in different orientations to disperse both floating and settling material, and the orientation of the mixing elements can in some cases be adjustable. In some preferred mixing systems the velocity vo of the jet as it meets the ambient fluid is from about 2 to 300 m/s, e.g., about 5 to 150 m/s or about 10 to 100 m/s. The power consumption of the mixing system may be about 20 to 1000 KW, e.g., 30 to 570 KW or 50 to 500 KW, or 150 to 250KW for a 100,000 L tank. It is generally preferred that the power usage be low for cost-effectiveness. Jet mixing involves the discharge of a submerged jet, or a number of submerged jets, of high velocity liquid into a fluid medium, in this case the mixture of biomass feedstock, liquid medium and saccharifying agent. The jet of liquid penetrates the fluid medium, with its energy being dissipated by turbulence and some initial heat. This turbulence is associated with velocity gradients (fluid shear). The surrounding fluid is accelerated and entrained into the jet flow, with this secondary entrained flow increasing as the distance from the jet nozzle increases. The momentum of the secondary flow remains generally constant as the jet expands, as long as the flow docs not hit a wall, floor or other obstacle. The longer the flow continues before it hits any obstacle, the more liquid is entrained into the secondary flow, increasing the bulk flow in the tank or vessel. When it encounters an obstacle, the secondary flow will lose momentum, more or less depending on the geometry of the tank, e.g., the angle at which the flow impinges on the obstacle. It is generally desirable to orient the jets and/or design the tank so that hydraulic losses to the tank walls are minimized. For example, it may be desirable for the tank to have an arcuate bottom (e.g., a domed headplate), and for the jet mixers to be oriented relatively close to the sidewalls, as shown in FIG. 22. The tank bottom (lower head plate) may have any desired domed configuration, or may have an elliptical or conical geometry. Referring to FIG. 4, the high velocity gradient between the core flow from a submerged jet and the surrounding fluid causes eddies. FIG. 4A illustrates the general characteristics of a submerged jet. As the submerged jet expands into the surrounding ambient environment the velocity profile flattens as the distance (x) from the nozzle increases. Also, the velocity gradient dv/dr changes with r (the distance from the centerline of the jet) at a given distance x, such that eddies are created which define the mixing zone (the conical expansion from the nozzle). = energy flux of fluid emerging from the nozzle (m3/s). One advantage of jet mixing is that the temperature of the ambient fluid (other than directly adjacent the exit of the nozzle, where there may be some localized heating) is increased only slightly if at all. For example, the temperature may be increased by less than 5°C, less than 1°C, or not to any measureable extent. The impeller 210 may have any desired geometry that will draw liquid through the shroud at a high velocity. The impeller is preferably a marine impeller, as shown in FIG. 4A, but may have a different design, for example, a Rushton impeller as shown in FIG. 4B, or a modified Rushton impeller, e.g., tilted so as to provide some axial flow. Another type of jet mixer includes a primary nozzle that delivers a pressurized fluid from a pump, a suction inlet adjacent the primary nozzle through which ambient fluid is drawn by the pressure drop between the primary nozzle and the wider inlet, and a suction chamber extending between the suction inlet and a secondary nozzle. A jet of high velocity fluid exits the secondary nozzle. An example of this type of mixer is shown in FIG. 6. As shown, in mixer 600 pressurized liquid from a pump (not shown) flows through an inlet passage 602 and exits through a primary nozzle 603. Ambient liquid is drawn through a suction inlet 604 into suction chamber 606 by the pressure drop caused by the flow of pressurized liquid. The combined flow exits from the suction chamber into the ambient liquid at high velocity through secondary nozzle 608. Mixing occurs both in the suction chamber and in the ambient liquid due to the jet action of the exiting jet of liquid. A mixing system that operates according to a similar principle is shown in FIG. 6A. Mixers embodying this design are commercially available from ITT Water and Wastewater, under the tradename Flygt™ jet mixers. In system 618, pump 620 generates a primary flow that is delivered to the tank (not shown) through a suction nozzle system 622. The suction nozzle system 622 includes a primary nozzle 624 which functions in a manner similar to primary nozzle 603 described above, causing ambient fluid to be drawn into the adjacent open end 626 of ejector tube 628 due to the pressure drop induced by the fluid exiting the primary nozzle. The combined flow then exits the other end 630 of ejector tube 628, which functions as a secondary nozzle, as a high velocity jet. The nozzle shown in FIG. 7, referred to as an eductor nozzle, operates under a similar principle. A nozzle embodying this design is commercially available under the tradename TeeJet®. As shown, in nozzle 700 pressurized liquid flows in through an inlet 702 and exits a primary nozzle 704, drawing ambient fluid in to the open end 706 of a diffuser 708. The combined flow exits the opposite open end 710 of the diffuser at a circulation flow rate A + B that is the sum of the inlet flow rate A and the flow rate B of the entrained ambient fluid. Another type of jet mixing system that can be utilized is referred to in the wastewater industry as "jet aeration mixing." In the wastewater industry, these mixers are typically used to deliver a jet of a pressurized air and liquid mixture, to provide aeration. However, in the present application in some cases the jet aeration type mixers are utilized without pressurized gas, as will be discussed below. The principles of operation of jet aeration mixers will be initially described in the context of their use with pressurized gas, for clarity. An eddy jet mixer, such as the mixer 800 shown in FIGS. 8-8B, includes multiple jets 802 mounted in a radial pattern on a central hub 804. The radial pattern of the jets uniformly distributes mixing energy throughout the tank. The eddy jet mixer may be centrally positioned in a tank, as shown, to provide toroidal flow about the center axis of the tank. The eddy jet mixer may be mounted on piping 806, which supplies high velocity liquid to the eddy jet mixer. In the embodiment shown in FIG. 8B, air is also supplied to the eddy jet mixer through piping 812. The high velocity liquid is delivered by a pump 808 which is positioned outside of the tank and which draws liquid in through an inlet 810 in the side wall of the tank. FIGS. 9 and 10 show two types of nozzle configurations that are designed to mix a gas and a liquid stream and eject a high velocity jet. These nozzles are configured somewhat differently from the eddy jet mixer shown in FIGS. 8 and 8A but function in a similar manner. In the system 900 shown in FIG. 9, a primary or motive fluid is directed through a liquid line 902 to inner nozzles 904 through which the liquid travels at high velocity into a mixing area 906. A second fluid, e.g., a gas, such as compressed air, nitrogen or carbon dioxide, or a liquid, enters the mixing area through a second line 908 and entrained in the motive fluid entering the mixing area 906 through the inner nozzles. In some instances the second fluid is nitrogen or carbon dioxide so as to reduce oxidation of the enzyme. The combined flow from the two lines is jetted into the mixing tank through the outer nozzles 910. If the second fluid is a gas, tiny bubbles are entrained in the liquid in the mixture. Liquid is supplied to the liquid line 902 by a pump. Gas, if it is used, is provided by compressors. If a liquid is used as the second fluid, it can have the same velocity as the liquid entering through the liquid line 902, or a different velocity. FIG. 10 shows an alternate nozzle design 1000, in which outer nozzles 1010 (of which only one is shown) are positioned along the length of an elongated member 1011 that includes a liquid line 1002 that is positioned parallel to a second line 1008. Each nozzle includes a single outer nozzle 1010 and a single inner nozzle 1004. Mixing of the motive liquid with the second fluid proceeds in the same manner as in the system 900 described above. FIGS. 11 and 12 illustrate examples of jet aeration type mixing systems in which nozzles are positioned along the length of an elongated member. In the example shown in FIG. 11, the elongated member 1102 is positioned along the diameter of the tank 1104, and the nozzles 1106 extend in opposite directions from the nozzle to produce the indicated flow pattern which includes two areas of generally elliptical flow, one on either side of the central elongated member. In the example shown in FIG. 12, the tank 1204 is generally rectangular in cross section, and the elongated member 1202 extends along one side wall 1207 of the tank. In this case, the nozzles 1206 all face in the same direction, towards the opposite side wall 1209. This produces the flow pattern shown, in which flow in the tank is generally elliptical about a major axis extending generally centrally along the length of the tank. In the embodiment shown in FIG. 12, the nozzles may be canted towards the tank floor, e.g., at an angle of from about 15 to 30 degrees from the horizontal. In another embodiment, shown in FIG. 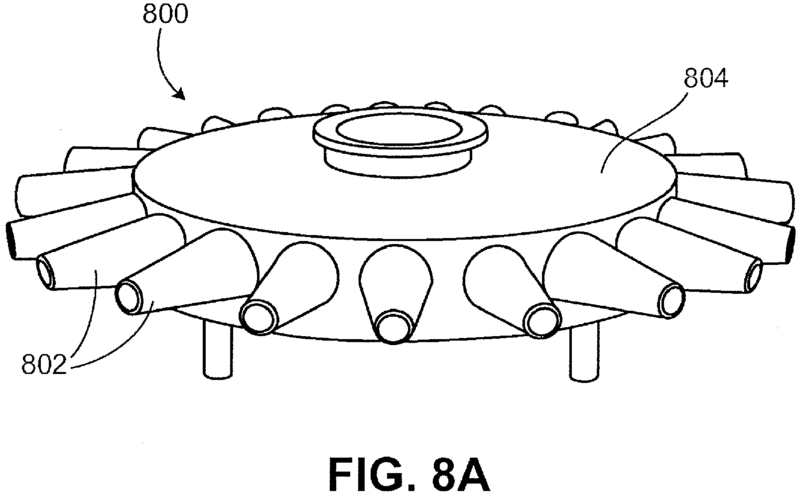 13, the nozzles 1302, 1304, and suction inlet 1306 are arranged to cause the contents of the tank to both revolve and rotate in a toroidal, rolling donut configuration around a central vertical axis of the tank. Flow around the surface of the toroid is drawn down the tank center, along the floor, up the walls and back to the center, creating a rolling helix pattern, which sweeps the center and prevents solids from settling. The toroidal pattern is also effective in moving floating solids to the tank center where they are pulled to the bottom and become homogenous with the tank contents. The result is a continuous helical flow pattern, which minimizes tank dead spots. In some instances, the jet nozzles described herein can become plugged, which may cause efficiency and cost effectiveness to be reduced. Plugging of the nozzles may be removed by reversing flow of the motive liquid through the nozzle. For example, in the system shown in FIG. 14, this is accomplished by closing a valve 1402 between the pump 1404 and the liquid line 1406 flowing to the nozzles 1408, and activating a secondary pump 1410. Secondary pump 1410 draws fluid in through the nozzles. The fluid then travels up through vertical pipe 1412 due to valve 1402 being closed. The fluid exits the vertical pipe 1412 at its outlet 1414 for recirculation through the tank. As noted above, if desired saccharification can take place in part or entirely during transportation of the mixture, e.g., between a first processing plant for treating the feedstock and a second processing plant for production of a final product such as ethanol. In this case, mixing can be conducted using a jet mixer designed for rail car or other portable use. Examples of such mixers will be discussed below. As shown diagrammatically in FIGS. 15 and 15A, mixers 1602, 1604 can be inserted through a port 1606 in a tank, e.g., of a truck (FIG. 15) or a railcar (FIG. 15A). The mixer can be operated using a control system 1608 external to the tank, which may include for example a motor and/or a supply or compressed air, depending on the type of mixing system used, and a controller configured to control the operation of the mixer. Venting (not shown) may also be provided. An alternative type of mixer utilizes a gas delivered in pulses to the mixture. Such a mixer is shown diagrammatically in FIGS. 15 and 15A, as an example of a portable railcar mixer. Metered amounts of high pressure gas are injected or pulsed under flat round discs (accumulator plates) positioned near the tank bottom. The sudden release of air shocks the liquid. As the gas moves outward between the plate and the tank floor, it sweeps out solids that have settled. The gas then accumulates above the plate into large, oval shaped bubbles. As each bubble rises to the surface, it pushes the liquid above it up and out towards the tank perimeter. The liquid moves toward the sides of the tank and travels down the tank wall to the bottom. This movement of the bubbles forces solids to the surface and creates a generally circular or toroidal circulation of liquid in the tank. The gas may be, for example, air, nitrogen, or carbon dioxide. The tank is vented (not shown) to allow gas to escape from the tank during mixing. FIGS. 16 and 16A illustrate agitators configured to be mounted on a shaft (not shown) for rotational mixing at relatively low speeds. The agitators may include, for example, two mixing elements 1702 (FIG. 16), or three mixing elements (FIG. 16A), mounted on support arms 1701 about a central mounting hub 1703 that is disposed to receive a shaft. The mixing elements 1702 are in the form of truncated cones, each of which has a first end 1704 and a second end 1706. The first end has a cross-section greater than the cross-section of the second end. The mixing elements are positioned such that the central axes of the mixing elements are disposed at an angle relative to a plane of rotation of the mixing elements. The agitator is rotated in a direction so that liquid flows in through the first end 1704 and out through the second end 1706 at a higher velocity, creating dynamic flow conditions by generating turbulent flow at the tapered end of each mixing element. The angulation of the mixing elements relative to the plane of rotation tends to cause a continuous closed circular flow which in the vicinity of an adjacent tank or container wall flows upwardly and in the central part of the tank or container flows downwardly coaxially to the mixer shaft where it passes through the intermediate spaces between the support arms 1701. The intensity of this circular flow depends on the magnitude of the angle. Mixers of this type are available commercially from Inotcc under the tradename Visco-Jet™. Folding mixers are available which can be put in rail car or other transport container. A similar type of mixer is described in U.S. Patent No. 6,921,194 , the full disclosure if which is incorporated herein by reference. In some situations, in particular at solids levels approaching a theoretical or practical limit, material may accumulate along the side wall and/or bottom wall of the tank during mixing. This phenomenon, referred to as "hold up," is undesirable as it can result in inadequate mixing. Several approaches can be taken to minimize hold up and ensure good mixing throughout the tank. For example, in addition to the jet mixing device(s), the tank can be outfitted with a scraping device, for example a device having a blade that scrapes the side of the tank in a "squeegee" manner. Such devices are well known, for example in the dairy industry. Suitable agitators include the side and bottom sweep agitators and scraper blade agitators manufactured by Walker Engineered Products, New Lisbon, WI. As shown in FIG. 18, a side and bottom sweep agitator 1800 may include a central elongated member 1802, mounted to rotate about the axis of the tank. Side wall scraper blades 1804 arc mounted at each end of the elongated member 1802 and are disposed at an angle with respect to the elongated member. In the embodiment shown, a pair of bottom wall scraper blades 1806 are mounted at an intermediate point on the elongated member 1802, to scrape up any material accumulating on the tank bottom. These scrapers may be omitted if material is not accumulating on the tank bottom. As shown in FIG. 18A, the scraper blades 1804 may be in the form of a plurality of scraper elements positioned along the side wall. In other embodiments, the scraper blades are continuous, or may have any other desired geometry. In other embodiments, the jet mixer itself is configured so as to minimize hold up. For example, the jet mixer may include one or more movable heads and/or flexible portions that move during mixing. For example, the jet mixer may include an elongated rotatable member having a plurality of jet nozzles along its length. The elongated member may be planar, as shown in FIG. 19, or have a non-planar shape, e.g., it may conform to the shape of the tank walls as shown in FIG. 20. Referring to FIG. 19, the jet mixer nozzles may be positioned on a rotating elongated member 1900 that is driven by a motor 1902 and shaft 1904. Water or other fluid is pumped through passageways in the rotating member, e.g., by a pump impeller 1906, and exits as a plurality of jets through jet orifices 1908 while the member 1900 rotates. To reduce hold up on the tank side walls, orifices 1910 may be provided at the ends of the member 1900. In the embodiment shown in FIG. 20, to conform to the particular shape of the tank 2000 the elongated member includes horizontally extending arms 2002, downwardly inclined portions 2004, outwardly and upwardly inclined portions 2006, and vertically extending portions 2008. Fluid is pumped through passageways within the elongated member to a plurality of jet orifices 38, through which jets are emitted while the elongated member is rotated. In both of the embodiments shown in FIGS. 19 and 20, the jets provide mixing while also washing down the side walls of the tank. In other embodiments, the jet mixer may include flexible members and or adjustable members (e.g., bendable or telescoping tubes) through which the jets are delivered. For example, as shown diagrammatically in FIGS. 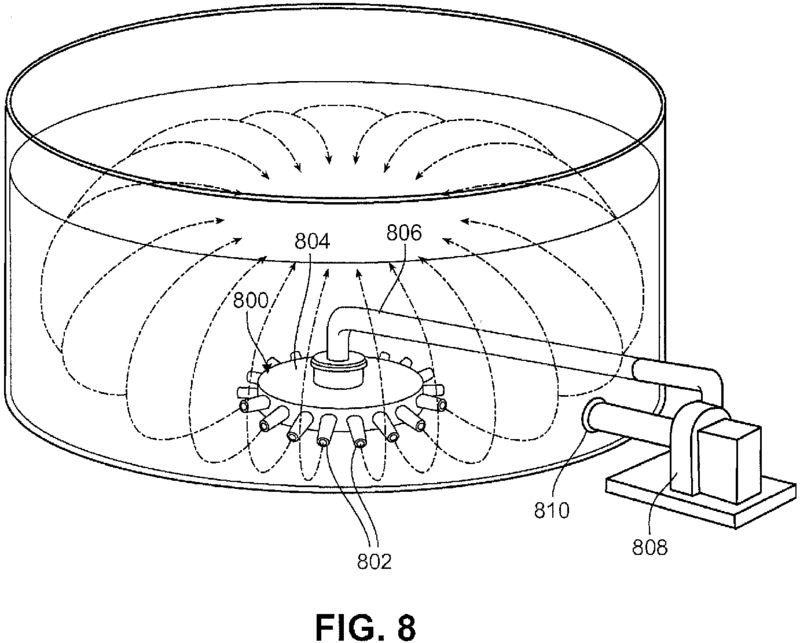 21 and 21A, the jet mixing device may be made up of flexible tubing, in the manner of a floating type of pool cleaner, such as is disclosed in U.S. Patent No. 3,883,368 . In the system 2100 shown, a flexible supply hose 2102 delivers fluid from an inlet 2104 in the sidewall of the tank 2106. The supply hose 2102 extends along the surface of the liquid in the tank via a series of buoys 2108 and swivels 2110. A plurality of flexible hoses 2112 are secured at their upper ends to spaced T-joints 2114 in the floating portion of the supply hose 2102. Fluid is jetted from the open distal ends of the flexible hoses 2112, resulting in mixing of the contents of the tank and removal of hold up on the tank side walls. In some implementations, combinations of the embodiments described above may be used. For example, combinations of planar and non-planar rotating or oscillating elongated members may be used. The moving nozzle arrangements described above can be used in combination with each other and/or in combination with scrapers. A plurality of moving nozzle arrangements can be used together, for example two or more of the rotating members shown in FIG. 19 can be stacked vertically in the tank. When multiple rotating members are used, they can be configured to rotate in the same direction or in opposite directions, and at the same speed or different speeds. The biomass can be, e.g., a cellulosic or lignocellulosic material. Such materials include paper and paper products (e.g., polycoated paper and Kraft paper), wood, wood-related materials, e.g., particle board, grasses, rice hulls, bagasse, jute, hemp, flax, bamboo, sisal, abaca, straw, switchgrass, alfalfa, hay, corn cobs, corn stover, coconut hair; and materials high in α-cellulose content, e.g., cotton. Feedstocks can be obtained from virgin scrap textile materials, e.g., remnants, post consumer waste, e.g., rags. When paper products are used they can be virgin materials, e.g., scrap virgin materials, or they can be post-consumer waste. Aside from virgin raw materials, post-consumer, industrial (e.g., offal), and processing waste (e.g., effluent from paper processing) can also be used as fiber sources. Biomass feedstocks can also be obtained or derived from human (e.g., sewage), animal or plant wastes. Additional cellulosic and lignocellulosic materials have been described in U.S. Patent Nos. 6,448,307 , 6,258,876 , 6,207,729 , 5,973,035 and 5,952,105 . In some cases the biomass is a microbial material. Microbial sources include, but are not limited to, any naturally occurring or genetically modified microorganism or organism that contains or is capable of providing a source of carbohydrates (e.g., cellulose), for example, protists, e.g., animal protists (e.g., protozoa such as flagellates, amoeboids, ciliatcs, and sporozoa) and plant protists (e.g., algae such alveolates, chlorarachniophytes, cryptomonads, euglenids, glaucophytes, haptophytes, red algae, stramenopiles, and viridaeplantae). Other examples include seaweed, plankton (e.g., macroplankton, mesoplankton, microplankton, nanoplankton, picoplankton, and femptoplankton), phytoplankton, bacteria (e.g., gram positive bacteria, gram negative bacteria, and extremophiles), yeast and/or mixtures of these. In some instances, microbial biomass can be obtained from natural sources, e.g., the ocean, lakes, bodies of water, e.g., salt water or fresh water, or on land. Alternatively or in addition, microbial biomass can be obtained from culture systems, e.g., large scale dry and wet culture systems. Suitable cellobiases include a cellobiase from Aspergillus niger sold under the tradename NOVOZYME 188™. Cellulases arc capable of degrading biomass, and may be of fungal or bacterial origin. Suitable enzymes include cellulases from the genera Bacillus, Pseudomonas, Humicola, Fusarium, Thielavia, Acremonium, Chrysosporium and Trichoderma, and include species of Humicola, Coprinus, Thielavia, Fusarium, Myceliophthora, Acremonium, Cephalosporium, Scytalidium, Penicillium or Aspergillus (see, e.g., EP 458162 ), especially those produced by a strain selected from the species Humicola insolens (reclassified as Scytalidium thermophilum, see, e.g., U.S. Patent No. 4,435,307 ), Coprinus cinereus, Fusarium oxysporum, Myceliophthora thermophila, Meripilus giganteus, Thielavia terrestris, Acremonium sp., Acremonium persicinum, Acremonium acremonium, Acremonium brachypenium, Acremonium dichromosporum, Acremonium obclavatum, Acremonium pinkertoniae, Acremonium roseogriseum, Acremonium incoloratum, and Acremonium furatum; preferably from the species Humicola insolens DSM 1800, Fusarium oxysporum DSM 2672, Myceliophthora thermophila CBS 117.65, Cephalosporium sp. RYM-202, Acremonium sp. CBS 478.94, Acremonium sp. CBS 265.95, Acremonium persicinum CBS 169.65, Acremonium acremonium AHU 9519, Cephalosporium sp. CBS 535.71, Acremonium brachypenium CBS 866.73, Acremonium dichromosporum CBS 683.73, Acremonium obclavatum CBS 311.74, Acremonium pinkertoniae CBS 157.70, Acremonium roseogriseum CBS 134.56, Acremonium incoloratum CBS 146.62, and Acrenionium juration CBS 299.70H. Cellulolytic enzymes may also be obtained from Chrysosporium, preferably a strain of Chrysosporium lucknowense. Additionally, Trichoderma (particularly Trichoderma viride, Trichoderma reesei, and Trichoderma koningii), alkalophilic Bacillus (see, for example, U.S. Patent No. 3,844,890 and EP 458162 ), and Streptomyces (see, e.g., EP 458162 ) may be used. Enzyme complexes may be utilized, such as those available from Genencore under the tradename ACCELLERASE®, for example, Accellerase® 1500 enzyme complex. Accellerase 1500 enzyme complex contains multiple enzyme activities, mainly exoglucanase, endoglucanase (2200-2800 CMC U/g), hemi-cellulase, and beta-glucosidase (525-775 pNPG U/g), and has a pH of 4.6 to 5.0. The endoglucanase activity of the enzyme complex is expressed in carboxymethylcellulose activity units (CMC U), while the beta-glucosidase activity is reported in pNP-glucoside activity units (pNPG U). In one embodiment, a blend of Accellerase® 1500 enzyme complex and NOVOZYME™ 188 cellobiase is used. Suitable fermenting microorganisms have the ability to convert carbohydrates, such as glucose, xylose, arabinose, mannose, galactose, oligosaccharides or polysaccharides into fermentation products. Fermenting microorganisms include strains of the genus Sacchromyces spp. e.g., Sacchromyces cerevisiae (baker's yeast), Saccharomyces distaticus, Saccharomyces uvarum; the genus Kluyveromyces, e.g., species Kluyveromyces marxianus, Kluyveromyces fragilis; the genus Candida, e.g., Candida pseudotropicalis, and Candida brassicae, Pichia stipitis (a relative of Candida shehatae, the genus Clavispora, e.g., species Clavispora lusitaniae and Clavispora opuntiae, the genus Pachysolen, e.g., species Pachysolen tannophilus, the genus Bretannomyces, e.g., species Bretannomyces clausenii (Philippidis, G. P., 1996, Cellulose bioconversion technology, in Handbook on Bioethanol: Production and Utilization, Wyman, C.E., ed., Taylor & Francis, Washington, DC, 179-212). The addition of surfactants can enhance the rate of saccharification. Examples of surfactants include non-ionic surfactants, such as a Tween® 20 or Tween® 80 polyethylene glycol surfactants, ionic surfactants, or amphoteric surfactants. Other suitable surfactants include octylphenol ethoxylates such as the TRITON™ X series nonionic surfactants commercially available from Dow Chemical. A surfactant can also be added to keep the sugar that is being produced in solution, particularly in high concentration solutions. In some implementations, the feedstock is physically treated prior to saccharification and/or fermentation. Physical treatment processes can include one or more of any of those described herein, such as mechanical treatment, chemical treatment, irradiation, sonication, oxidation, pyrolysis or steam explosion. Treatment methods can be used in combinations of two, three, four, or even all of these technologies (in any order). When more than one treatment method is used, the methods can be applied at the same time or at different times. Other processes that change a molecular structure of a biomass feedstock may also be used, alone or in combination with the processes disclosed herein. If desired, the mechanically treated material can be passed through a screen, e.g., having an average opening size of 1.59 mm or less (1/16 inch, 0.0625 inch). In some embodiments, shearing, or other mechanical treatment, and screening are performed concurrently. For example, a rotary knife cutter can be used to concurrently shear and screen the feedstock. The feedstock is sheared between stationary blades and rotating blades to provide a sheared material that passes through a screen, and is captured in a bin. The cellulosic or lignocellulosic material can also be mechanically treated under a gas (such as a stream or atmosphere of gas other than air), e.g., oxygen or nitrogen, or steam. In some embodiments, a BET surface area of the mechanically treated material is greater than 0.1 m2/g, e.g., greater than 0.25 m2/g, greater than 0.5 m2/g, greater than 1.0 m2/g, greater than 1.5 m2/g, greater than 1.75 m2/g, greater than 5.0 m2/g, greater than 10 m2/g, greater than 25 m2/g, greater than 35 m2/g, greater than 50m2/g, greater than 60 m2/g, greater than 75 m2/g, greater than 100 m2/g, greater than 150 m2/g, greater than 200 m2/g, or even greater than 250 m2/g. If the feedstock is a fibrous material the fibers of the mechanically treated material can have a relatively large average length-to-diameter ratio (e.g., greater than 20-to-1), even if they have been sheared more than once. In addition, the fibers of the fibrous materials described herein may have a relatively narrow length and/or length-to-diameter ratio distribution. If the feedstock is a fibrous material the average length-to-diameter ratio of fibers of the mechanically treated material can be, e.g., greater than 8/1, e.g., greater than 10/1, greater than 15/1, greater than 20/1, greater than 25/1, or greater than 50/1. An average fiber length of the mechanically treated material can be, e.g., between about 0.5 mm and 2.5 mm, e.g., between about 0.75 mm and 1.0 mm, and an average width (e.g., diameter) of the second fibrous material 14 can be, e.g., between about 5 µm and 50 µm, e.g., between about 10 µm and 30 µm. In some embodiments, if the feedstock is a fibrous material the standard deviation of the fiber length of the mechanically treated material can be less than 60 percent of an average fiber length of the mechanically treated material, e.g., less than 50 percent of the average length, less than 40 percent of the average length, less than 25 percent of the average length, less than 10 percent of the average length, less than 5 percent of the average length, or even less than 1 percent of the average length. In some situations, it can be desirable to prepare a low bulk density material, densify the material (e.g., to make it easier and less costly to transport to another site), and then revert the material to a lower bulk density state. Densified materials can be processed by any of the methods described herein, or any material processed by any of the methods described herein can be subsequently densified, e.g., as disclosed in U.S. Serial No. 12/429, 045 and WO 2008/073186 , the full disclosures of which are incorporated herein by reference. One or more radiation processing sequences can be used to process the feedstock, and to provide a structurally modified material which functions as input to further processing steps and/or sequences. Irradiation can, for example, reduce the molecular weight and/or crystallinity of feedstock. Radiation can also sterilize the materials, or any media needed to bioprocess the material. In some embodiments, energy deposited in a material that releases an electron from its atomic orbital is used to irradiate the materials. The radiation may be provided by (1) heavy charged particles, such as alpha particles or protons, (2) electrons, produced, for example, in beta decay or electron beam accelerators, or (3) electromagnetic radiation, for example, gamma rays, x rays, or ultraviolet rays. In one approach, radiation produced by radioactive substances can be used to irradiate the feedstock. In another approach, electromagnetic radiation (e.g., produced using electron beam emitters) can be used to irradiate the feedstock. In some embodiments, any combination in any order or concurrently of (1) through (3) may be utilized. The doses applied depend on the desired effect and the particular feedstock. In some instances when chain scission is desirable and/or polymer chain functionalization is desirable, particles heavier than electrons, such as protons, helium nuclei, argon ions, silicon ions, neon ions, carbon ions, phoshorus ions, oxygen ions or nitrogen ions can be utilized. When ring-opening chain scission is desired, positively charged particles can be utilized for their Lewis acid properties for enhanced ring-opening chain scission. For example, when maximum oxidation is desired, oxygen ions can be utilized, and when maximum nitration is desired, nitrogen ions can be utilized. The use of heavy particles and positively charged particles is described in U.S. Serial No. 12/417,699 , the full disclosure of which is incorporated herein by reference. In one method, a first material that is or includes cellulose having a first number average molecular weight (MN1) is irradiated, e.g., by treatment with ionizing radiation (e.g., in the form of gamma radiation, X-ray radiation, 100 nm to 280 nm ultraviolet (UV) light, a beam of electrons or other charged particles) to provide a second material that includes cellulose having a second number average molecular weight (MN2) lower than the first number average molecular weight. The second material (or the first and second material) can be combined with a microorganism (with or without enzyme treatment) that can utilize the second and/or first material or its constituent sugars or lignin to produce an intermediate or product, such as those described herein. Since the second material includes cellulose having a reduced molecular weight relative to the first material, and in some instances, a reduced crystallinity as well, the second material is generally more dispersible, swellable and/or soluble, e.g., in a solution containing a microorganism and/or an enzyme. These properties make the second material easier to process and more susceptible to chemical, enzymatic and/or biological attack relative to the first material, which can greatly improve the production rate and/or production level of a desired product, e.g., ethanol. In some embodiments, the second number average molecular weight (MN2) is lower than the first number average molecular weight (MN1) by more than about 10 percent, e.g., more than about 15, 20, 25, 30, 35, 40, 50 percent, 60 percent, or even more than about 75 percent. In some instances, the second material includes cellulose that has a crystallinity (C2) that is lower than the crystallinity (C1) of the cellulose of the first material. For example, (C2) can be lower than (C1) by more than about 10 percent, e.g., more than about 15, 20, 25, 30, 35, 40, or even more than about 50 percent. In some embodiments, the starting crystallinity index (prior to irradiation) is from about 40 to about 87.5 percent, e.g., from about 50 to about 75 percent or from about 60 to about 70 percent, and the crystallinity index after irradiation is from about 10 to about 50 percent, e.g., from about 15 to about 45 percent or from about 20 to about 40 percent. However, in some embodiments, e.g., after extensive irradiation, it is possible to have a crystallinity index of lower than 5 percent. In some embodiments, the material after irradiation is substantially amorphous. In some embodiments, the starting number average molecular weight (prior to irradiation) is from about 200,000 to about 3,200,000, e.g., from about 250,000 to about 1,000,000 or from about 250,000 to about 700,000, and the number average molecular weight after irradiation is from about 50,000 to about 200,000, e.g., from about 60,000 to about 150,000 or from about 70,000 to about 125,000. However, in some embodiments, e.g., after extensive irradiation, it is possible to have a number average molecular weight of less than about 10,000 or even less than about 5,000. Each form of radiation ionizes the carbon-containing material via particular interactions, as determined by the energy of the radiation. Heavy charged particles primarily ionize matter via Coulomb scattering; furthermore, these interactions produce energetic electrons that may further ionize matter. Alpha particles are identical to the nucleus of a helium atom and are produced by the alpha decay of various radioactive nuclei, such as isotopes of bismuth, polonium, astatine, radon, francium, radium, several actinidcs, such as actinium, thorium, uranium, neptunium, curium, californium, americium, and plutonium. When particles are utilized, they can be neutral (uncharged), positively charged or negatively charged. When charged, the charged particles can bear a single positive or negative charge, or multiple charges, e.g., one, two, three or even four or more charges. In instances in which chain scission is desired, positively charged particles may be desirable, in part due to their acidic nature. When particles are utilized, the particles can have the mass of a resting electron, or greater, e.g., 500, 1000, 1500, 2000, 10,000 or even 100,000 times the mass of a resting electron. For example, the particles can have a mass of from about 1 atomic unit to about 150 atomic units, e.g., from about 1 atomic unit to about 50 atomic units, or from about 1 to about 25, e.g., 1, 2, 3, 4, 5, 10, 12 or 15 amu. Accelerators used to accelerate the particles can be electrostatic DC, electrodynamic DC, RF linear, magnetic induction linear or continuous wave. For example, cyclotron type accelerators are available from IBA, Belgium, such as the Rhodotron® system, while DC type accelerators are available from RD1, now IBA Industrial, such as the Dynamitron®. Ions and ion accelerators are discussed in Introductory Nuclear Physics, Kenneth S. Krane, John Wiley & Sons, Inc. (1988), Krsto Prelec, FIZIKA B 6 (1997) 4, 177-206, Chu, William T., "Overview of Light-Ion Beam Therapy" Columbus-Ohio, ICRU-IAEA Meeting, 18-20 March 2006, Iwata, Y. et al., "Alternating-Phase-Focused IH-DTL for Heavy-Ion Medical Accelerators" Proceedings of EPAC 2006, Edinburgh, Scotland and Leaner, C.M. et al., "Status of the Superconducting ECR Ion Source Venus" Proceedings of EPAC 2000, Vienna, Austria. Gamma radiation has the advantage of a significant penetration depth into a variety of materials. Sources of gamma rays include radioactive nuclei, such as isotopes of cobalt, calcium, technicium, chromium, gallium, indium, iodine, iron, krypton, samarium, selenium, sodium, thalium, and xenon. Sources of x rays include electron beam collision with metal targets, such as tungsten or molybdenum or alloys, or compact light sources, such as those produced commercially by Lyncean. Sources for infrared radiation include sapphire, zinc, or selenide window ceramic lamps. Sources for microwaves include klystrons, Slevin type RF sources, or atom beam sources that employ hydrogen, oxygen, or nitrogen gases. In some embodiments, a beam of electrons is used as the radiation source. A beam of electrons has the advantages of high dose rates (e.g., 1, 5, or even 10 Mrad per second), high throughput, less containment, and less confinement equipment. Electrons can also be more efficient at causing chain scission. In addition, electrons having energies of 4-10 MeV can have a penetration depth of 5 to 30 mm or more, such as 40 mm. Electron beams can be generated, e.g., by electrostatic generators, cascade generators, transformer generators, low energy accelerators with a scanning system, low energy accelerators with a linear cathode, linear accelerators, and pulsed accelerators. Electrons as an ionizing radiation source can be useful, e.g., for relatively thin sections of material, e.g., less than 0.5 inch, e.g., less than 0.4 inch, 0.3 inch, 0.2 inch, or less than 0.1 inch. In some embodiments, the energy of each electron of the electron beam is from about 0.3 MeV to about 2.0 MeV (million electron volts), e.g., from about 0.5 MeV to about 1.5 MeV, or from about 0.7 MeV to about 1.25 MeV. Electron beam irradiation devices may be procured commercially from Ion Beam Applications, Louvain-la-Neuve, Belgium or the Titan Corporation, San Diego, CA. Typical electron energies can be 1 MeV, 2 MeV, 4.5 MeV, 7.5 MeV, or 10 MeV. Typical electron beam irradiation device power can be 1 kW, 5 kW, 10 kW, 20 kW, 50 kW, 100 kW, 250 kW, or 500 kW. The level of depolymerization of the feedstock depends on the electron energy used and the dose applied, while exposure time depends on the power and dose. Typical doses may take values of 1 kGy, 5 kGy, 10 kGy, 20 kGy, 50 kGy, 100 kGy, or 200 kGy. Particles heavier than electrons can be utilized to irradiate materials, such as carbohydrates or materials that include carbohydrates, e.g., cellulosic materials, lignocellulosic materials, starchy materials, or mixtures of any of these and others described herein. For example, protons, helium nuclei, argon ions, silicon ions, neon ions carbon ions, phoshorus ions, oxygen ions or nitrogen ions can be utilized. In some embodiments, particles heavier than electrons can induce higher amounts of chain scission (relative to lighter particles). In some instances, positively charged particles can induce higher amounts of chain scission than negatively charged particles due to their acidity. Heavier particle beams can be generated, e.g., using linear accelerators or cyclotrons. In some embodiments, the energy of each particle of the beam is from about 1.0 MeV/atomic unit to about 6,000 MeV/atomic unit, e.g., from about 3 MeV/ atomic unit to about 4,800 MeV/atomic unit, or from about 10 MeV/atomic unit to about 1,000 MeV/atomic unit. In certain embodiments, ion beams used to irradiate carbon-containing materials, e.g., biomass materials, can include more than one type of ion. For example, ion beams can include mixtures of two or more (e.g., three, four or more) different types of ions. Exemplary mixtures can include carbon ions and protons, carbon ions and oxygen ions, nitrogen ions and protons, and iron ions and protons. More generally, mixtures of any of the ions discussed above (or any other ions) can be used to form irradiating ion beams. In particular, mixtures of relatively light and relatively heavier ions can be used in a single ion beam. In some embodiments, ion beams for irradiating materials include positively-charged ions. The positively charged ions can include, for example, positively charged hydrogen ions (e.g., protons), noble gas ions (e.g., helium, neon, argon), carbon ions, nitrogen ions, oxygen ions, silicon atoms, phosphorus ions, and metal ions such as sodium ions, calcium ions, and/or iron ions. Without wishing to be bound by any theory, it is believed that such positively-charged ions behave chemically as Lewis acid moieties when exposed to materials, initiating and sustaining cationic ring-opening chain scission reactions in an oxidative environment. In certain embodiments, ion beams for irradiating materials include negatively-charged ions. Negatively charged ions can include, for example, negatively charged hydrogen ions (e.g., hydride ions), and negatively charged ions of various relatively electronegative nuclei (e.g., oxygen ions, nitrogen ions, carbon ions, silicon ions, and phosphorus ions). Without wishing to be bound by any theory, it is believed that such negatively-charged ions behave chemically as Lewis base moieties when exposed to materials, causing anionic ring-opening chain scission reactions in a reducing environment. In some embodiments, beams for irradiating materials can include neutral atoms. For example, any one or more of hydrogen atoms, helium atoms, carbon atoms, nitrogen atoms, oxygen atoms, neon atoms, silicon atoms, phosphorus atoms, argon atoms, and iron atoms can be included in beams that are used for irradiation of biomass materials. In general, mixtures of any two or more of the above types of atoms (e.g., three or more, four or more, or even more) can be present in the beams. In certain embodiments, ion beams used to irradiate materials include singly-charged ions such as one or more of H+, H-, He+, Ne+, Ar+, C+, C-, O+, O-, N+, N-, Si+, Si-, P+, P-, Na+, Ca+, and Fe+. In some embodiments, ion beams can include multiply-charged ions such as one or more of C2+, C3+, C4+ , N3+, N5+, N3-, O2+, O2-, O2 2-, Si2+, Si4+, Si2-, and Si4-. In general, the ion beams can also include more complex polynuclear ions that bear multiple positive or negative charges. In certain embodiments, by virtue of the structure of the polynuclear ion, the positive or negative charges can be effectively distributed over substantially the entire structure of the ions. In some embodiments, the positive or negative charges can be somewhat localized over portions of the structure of the ions. In embodiments in which the irradiating is performed with electromagnetic radiation, the electromagnetic radiation can have, e.g., energy per photon (in electron volts) of greater than 102 eV, e.g., greater than 103, 104, 105, 106, or even greater than 107 cV. In some embodiments, the electromagnetic radiation has energy per photon of between 104 and 107, e.g., between 105 and 106 cV. The electromagnetic radiation can have a frequency of, e.g., greater than 1016 hz, greater than 1017 hz, 1018, 1019, 1020, or even greater than 1021 hz. In some embodiments, the electromagnetic radiation has a frequency of between 1018 and 1022 hz, e.g., between 1019 to 1021 hz. After treatment with ionizing radiation, any of the materials or mixtures described herein may become ionized; that is, the treated material may include radicals at levels that are detectable with an electron spin resonance spectrometer. If ionized biomass remains in the atmosphere, it will be oxidized, such as to an extent that carboxylic acid groups are generated by reacting with the atmospheric oxygen. In some instances with some materials, such oxidation is desired because it can aid in the further breakdown in molecular weight of the carbohydrate-containing biomass, and the oxidation groups, e.g., carboxylic acid groups can be helpful for solubility and microorganism utilization in some instances. However, since the radicals can "live" for some time after irradiation, e.g., longer than 1 day, 5 days, 30 days, 3 months, 6 months or even longer than 1 year, material properties can continue to change over time, which in some instances, can be undesirable. Thus, it may be desirable to quench the ionized material. After ionization, any biomass material that has been ionized can be quenched to reduce the level of radicals in the ionized biomass, e.g., such that the radicals are no longer detectable with the electron spin resonance spectrometer. For example, the radicals can be quenched by the application of a sufficient pressure to the biomass and/or by utilizing a fluid in contact with the ionized biomass, such as a gas or liquid, that reacts with (quenches) the radicals. Using a gas or liquid to at least aid in the quenching of the radicals can be used to functionalize the ionized biomass with a desired amount and kind of functional groups, such as carboxylic acid groups, enol groups, aldehyde groups, nitro groups, nitrile groups, amino groups, alkyl amino groups, alkyl groups, chloroalkyl groups or chlorofluoroalkyl groups. In some instances, such quenching can improve the stability of some of the ionized biomass materials. For example, quenching can improve the resistance of the biomass to oxidation. Functionalization by quenching can also improve the solubility of any biomass described herein, can improve its thermal stability, and can improve material utilization by various microorganisms. For example, the functional groups imparted to the biomass material by the quenching can act as receptor sites for attachment by microorganisms, e.g., to enhance cellulose hydrolysis by various microorganisms. In some embodiments, quenching includes an application of pressure to the biomass, such as by mechanically deforming the biomass, e.g., directly mechanically compressing the biomass in one, two, or three dimensions, or applying pressure to a fluid in which the biomass is immersed, e.g., isostatic pressing. In such instances, the deformation of the material itself brings radicals, which are often trapped in crystalline domains, in close enough proximity so that the radicals can recombine, or react with another group. In some instances, the pressure is applied together with the application of heat, such as a sufficient quantity of heat to elevate the temperature of the biomass to above a melting point or softening point of a component of the biomass, such as lignin, cellulose or hemicellulose. Heat can improve molecular mobility in the material, which can aid in the quenching of the radicals. When pressure is utilized to quench, the pressure can be greater than about 1000 psi, such as greater than about 1250 psi, 1450 psi, 3625 psi, 5075 psi, 7250 psi, 10000 psi or even greater than 15000 psi. In some embodiments, quenching includes contacting the biomass with a fluid, such as a liquid or gas, e.g., a gas capable of reacting with the radicals, such as acetylene or a mixture of acetylene in nitrogen, ethylene, chlorinated ethylenes or chlorofluoroethylenes, propylene or mixtures of these gases. In other particular embodiments, quenching includes contacting the biomass with a liquid, e.g., a liquid soluble in, or at least capable of penetrating into the biomass and reacting with the radicals, such as a diene, such as 1,5-cyclooctadiene. In some specific embodiments, quenching includes contacting the biomass with an antioxidant, such as Vitamin E. If desired, the biomass feedstock can include an antioxidant dispersed therein, and the quenching can come from contacting the antioxidant dispersed in the biomass feedstock with the radicals. Functionalization can be enhanced by utilizing heavy charged ions, such as any of the heavier ions described herein. For example, if it is desired to enhance oxidation, charged oxygen ions can be utilized for the irradiation. If nitrogen functional groups are desired, nitrogen ions or anions that include nitrogen can be utilized. Likewise, if sulfur or phosphorus groups are desired, sulfur or phosphorus ions can be used in the irradiation. In some instances, the irradiation is performed at a dosage rate of greater than about 0.25 Mrad per second, e.g., greater than about 0.5, 0.75, 1.0, 1.5, 2.0, or even greater than about 2.5 Mrad per second. In some embodiments, the irradiating is performed at a dose rate of between 5.0 and 1500.0 kilorads/hour, e.g., between 10.0 and 750.0 kilorads/hour or between 50.0 and 350.0 kilorads/hour. In some embodiments, the irradiating (with any radiation source or a combination of sources) is performed until the material receives a dose of at least 0.1 Mrad, at least 0.25 Mrad, e.g., at least 1.0 Mrad, at least 2.5 Mrad, at least 5.0 Mrad, at least 10.0 Mrad, at least 60 Mrad or at least 100 Mrad. In some embodiments, the irradiating is performed until the material receives a dose of from about 0.1 Mrad to about 500 Mrad, from about 0.5 Mrad to about 200 Mrad, from about 1 Mrad to about 100 Mrad, or from about 5 Mrad to about 60 Mrad. In some embodiments, a relatively low dose of radiation is applied, e.g., less than 60 Mrad. Sonication can reduce the molecular weight and/or crystallinity of materials, such as one or more of any of the materials described herein, e.g., one or more carbohydrate sources, such as cellulosic or lignocellulosic materials, or starchy materials. Sonication can also be used to sterilize the materials. As discussed above with regard to radiation, the process parameters used for sonication can be varied depending on various factors, e.g., depending on the lignin content of the feedstock. For example, feedstocks with higher lignin levels generally require a higher residence time and/or energy level, resulting in a higher total energy delivered to the feedstock. In one method, a first material that includes cellulose having a first number average molecular weight (MN1) is dispersed in a medium, such as water, and sonicated and/or otherwise cavitated, to provide a second material that includes cellulose having a second number average molecular weight (MN2) lower than the first number average molecular weight. The second material (or the first and second material in certain embodiments) can be combined with a microorganism (with or without enzyme treatment) that can utilize the second and/or first material to produce an intermediate or product. Since the second material includes cellulose having a reduced molecular weight relative to the first material, and in some instances, a reduced crystallinity as well, the second material is generally more dispersible, swellable, and/or soluble, e.g., in a solution containing a microorganism. 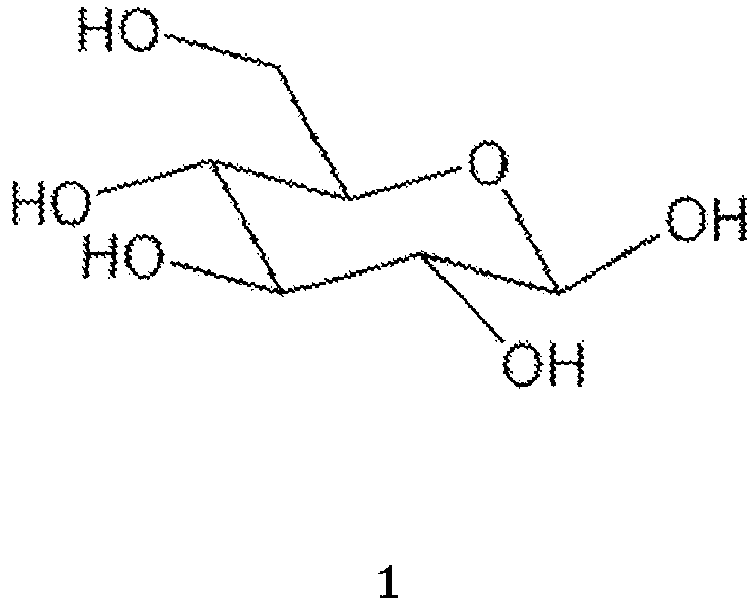 In some instances, the second material includes cellulose that has a crystallinity (C2) that is lower than the crystallinity (C1) of the cellulose of the first material. For example, (C2) can be lower than (C1) by more than about 10 percent, e.g., more than about 15, 20, 25, 30, 35, 40, or even more than about 50 percent. In some embodiments, the starting crystallinity index (prior to sonication) is from about 40 to about 87.5 percent, e.g., from about 50 to about 75 percent or from about 60 to about 70 percent, and the crystallinity index after sonication is from about 10 to about 50 percent, e.g., from about 15 to about 45 percent or from about 20 to about 40 percent. However, in certain embodiments, e.g., after extensive sonication, it is possible to have a crystallinity index of lower than 5 percent. In some embodiments, the material after sonication is substantially amorphous. In some embodiments, the starting number average molecular weight (prior to sonication) is from about 200,000 to about 3,200,000, e.g., from about 250,000 to about 1,000,000 or from about 250,000 to about 700,000, and the number average molecular weight after sonication is from about 50,000 to about 200,000, e.g., from about 60,000 to about 150,000 or from about 70,000 to about 125,000. However, in some embodiments, e.g., after extensive sonication, it is possible to have a number average molecular weight of less than about 10,000 or even less than about 5,000. In some embodiments, the second material can have a level of oxidation (O2) that is higher than the level of oxidation (O1) of the first material. A higher level of oxidation of the material can aid in its dispersability, swellability and/or solubility, further enhancing the material's susceptibility to chemical, enzymatic or microbial attack. In some embodiments, to increase the level of the oxidation of the second material relative to the first material, the sonication is performed in an oxidizing medium, producing a second material that is more oxidized than the first material. For example, the second material can have more hydroxyl groups, aldehyde groups, ketone groups, ester groups or carboxylic acid groups, which can increase its hydrophilicity. In some embodiments, the sonication medium is an aqueous medium. If desired, the medium can include an oxidant, such as a peroxide (e.g., hydrogen peroxide), a dispersing agent and/or a buffer. Examples of dispersing agents include ionic dispersing agents, e.g., sodium lauryl sulfate, and non-ionic dispersing agents, e.g., poly(ethylene glycol). In other embodiments, the sonication medium is non-aqueous. For example, the sonication can be performed in a hydrocarbon, e.g., toluene or heptane, an ether, e.g., diethyl ether or tetrahydrofuran, or even in a liquefied gas such as argon, xenon, or nitrogen. One or more pyrolysis processing sequences can be used to process carbon-containing materials from a wide variety of different sources to extract useful substances from the materials, and to provide partially degraded materials which function as input to further processing steps and/or sequences. Pyrolysis can also be used to sterilize the materials. Pyrolysis conditions can be varied depending on the characteristics of the feedstock and/or other factors. For example, feedstocks with higher lignin levels may require a higher temperature, longer residence time, and/or introduction of higher levels of oxygen during pyrolysis. In one example, a first material that includes cellulose having a first number average molecular weight (MN1) is pyrolyzed, e.g., by heating the first material in a tube furnace (in the presence or absence of oxygen), to provide a second material that includes cellulose having a second number average molecular weight (MN2) lower than the first number average molecular weight. Since the second material includes cellulose having a reduced molecular weight relative to the first material, and in some instances, a reduced crystallinity as well, the second material is generally more dispersible, swellable and/or soluble, e.g., in a solution containing a microorganism. In some instances, the second material includes cellulose that has a crystallinity (C2) that is lower than the crystallinity (C1) of the cellulose of the first material. For example, (C2) can be lower than (C1) by more than about 10 percent, e.g., more than about 15, 20, 25, 30, 35, 40, or even more than about 50 percent. In some embodiments, the starting crystallinity (prior to pyrolysis) is from about 40 to about 87.5 percent, e.g., from about 50 to about 75 percent or from about 60 to about 70 percent, and the crystallinity index after pyrolysis is from about 10 to about 50 percent, e.g., from about 15 to about 45 percent or from about 20 to about 40 percent. However, in certain embodiments, e.g., after extensive pyrolysis, it is possible to have a crystallinity index of lower than 5 percent. In some embodiments, the material after pyrolysis is substantially amorphous. In some embodiments, the starting number average molecular weight (prior to pyrolysis) is from about 200,000 to about 3,200,000, e.g., from about 250,000 to about 1,000,000 or from about 250,000 to about 700,000, and the number average molecular weight after pyrolysis is from about 50,000 to about 200,000, e.g., from about 60,000 to about 150,000 or from about 70,000 to about 125,000. However, in some embodiments, e.g., after extensive pyrolysis, it is possible to have a number average molecular weight of less than about 10,000 or even less than about 5,000. In some embodiments, the second material can have a level of oxidation (O2) that is higher than the level of oxidation (O1) of the first material. A higher level of oxidation of the material can aid in its dispersability, swellability and/or solubility, further enhancing the susceptibility of the material to chemical, enzymatic or microbial attack. In some embodiments, to increase the level of the oxidation of the second material relative to the first material, the pyrolysis is performed in an oxidizing environment, producing a second material that is more oxidized than the first material. For example, the second material can have more hydroxyl groups, aldehyde groups, ketone groups, ester groups or carboxylic acid groups, than the first material, thereby increasing the hydrophilicity of the material. In some embodiments, the pyrolysis of the materials is continuous. In other embodiments, the material is pyrolyzed for a pre-determined time, and then allowed to cool for a second pre-determined time before pyrolyzing again. One or more oxidative processing sequences can be used to process carbon-containing materials from a wide variety of different sources to extract useful substances from the materials, and to provide partially degraded and/or altered material which functions as input to further processing steps and/or sequences. The oxidation conditions can be varied, e.g., depending on the lignin content of the feedstock, with a higher degree of oxidation generally being desired for higher lignin content feedstocks. In one method, a first material that includes cellulose having a first number average molecular weight (MN1) and having a first oxygen content (O1) is oxidized, e.g., by heating the first material in a stream of air or oxygen-enriched air, to provide a second material that includes cellulose having a second number average molecular weight (MN2) and having a second oxygen content (O2) higher than the first oxygen content (O1). The second number average molecular weight of the second material is generally lower than the first number average molecular weight of the first material. For example, the molecular weight may be reduced to the same extent as discussed above with respect to the other physical treatments. The crystallinity of the second material may also be reduced to the same extent as discussed above with respect to the other physical treatments. In some embodiments, the second oxygen content is at least about five percent higher than the first oxygen content, e.g., 7.5 percent higher, 10.0 percent higher, 12.5 percent higher, 15.0 percent higher or 17.5 percent higher. In some preferred embodiments, the second oxygen content is at least about 20.0 percent higher than the first oxygen content of the first material. Oxygen content is measured by elemental analysis by pyrolyzing a sample in a furnace operating at 1300 °C or higher. A suitable elemental analyzer is the LECO CHNS-932 analyzer with a VTF-900 high temperature pyrolysis furnace. Generally, oxidation of a material occurs in an oxidizing environment. For example, the oxidation can be effected or aided by pyrolysis in an oxidizing environment, such as in air or argon enriched in air. To aid in the oxidation, various chemical agents, such as oxidants, acids or bases can be added to the material prior to or during oxidation. For example, a peroxide (e.g., benzoyl peroxide) can be added prior to oxidation. Some oxidative methods of reducing recalcitrance in a biomass feedstock employ Fenton-type chemistry. Such methods are disclosed, for example, in U.S. Serial No. 12/639,289 , the complete disclosure of which is incorporated herein by reference. Exemplary oxidants include peroxides, such as hydrogen peroxide and benzoyl peroxide, persulfates, such as ammonium persulfate, activated forms of oxygen, such as ozone, permanganates, such as potassium permanganate, perchlorates, such as sodium perchlorate, and hypochlorites, such as sodium hypochlorite (household bleach). In some situations, pH is maintained at or below about 5.5 during contact, such as between 1 and 5, between 2 and 5, between 2.5 and 5 or between about 3 and 5. Oxidation conditions can also include a contact period of between 2 and 12 hours, e.g., between 4 and 10 hours or between 5 and 8 hours. In some instances, temperature is maintained at or below 300 °C, e.g., at or below 250, 200, 150, 100 or 50 °C. In some instances, the temperature remains substantially ambient, e.g., at or about 20-25 °C. In some embodiments, the one or more oxidants are applied as a gas, such as by generating ozone in-situ by irradiating the material through air with a beam of particles, such as electrons. In some embodiments, the mixture further includes one or more hydroquinones, such as 2,5-dimethoxyhydroquinone (DMHQ) and/or one or more benzoquinones, such as 2,5-dimethoxy-1,4-benzoquinone (DMBQ), which can aid in electron transfer reactions. In some embodiments, the one or more oxidants are electrochemically-generated in-situ. For example, hydrogen peroxide and/or ozone can be electro-chemically produced within a contact or reaction vessel. Any of the processes of this paragraph can be used alone without any of the processes described herein, or in combination with any of the processes described herein (in any order): steam explosion, chemical treatment (e.g., acid treatment (including concentrated and dilute acid treatment with mineral acids, such as sulfuric acid, hydrochloric acid and organic acids, such as trifluoroacetic acid) and/or base treatment (e.g., treatment with lime or sodium hydroxide)), UV treatment, screw extrusion treatment (see, e.g., U.S. Patent Application Serial No. 61/115,398, filed November 17, 2008 , solvent treatment (e.g., treatment with ionic liquids) and freeze milling (see, e.g., U.S. Serial No. 12/502,629 ). The optimum pH for yeast is from about pH 4 to 5, while the optimum pH for Zymomonas is from about pH 5 to 6. Typical fermentation times are about 24 to 96 hours with temperatures in the range of 26 °C to 40 °C, however thermophilic microorganisms prefer higher temperatures. Mobile fermentors can be utilized, as described in U.S. Provisional Patent Application Serial 60/832,735 , now Published International Application No. WO 2008/011598 . Similarly, the saccharification equipment can be mobile. Further, saccharification and/or fermentation may be performed in part or entirely during transit. Other intermediates and products, including food and pharmaceutical products, are described in U.S. Serial No. 12/417,900 , the full disclosure of which is hereby incorporated by reference herein. A 1500 pound skid of virgin, half-gallon juice cartons made of un-printed polycoated white Kraft board having a bulk density of 20 lb/ft3 was obtained from International Paper. Each carton was folded flat, and then fed into a 3 hp Flinch Baugh shredder at a rate of approximately 15 to 20 pounds per hour. The shredder was equipped with two 12 inch rotary blades, two fixed blades and a 0.30 inch discharge screen. The gap between the rotary and fixed blades was adjusted to 0.10 inch. The output from the shredder resembled confetti having a width of between 0.1 inch and 0.5 inch, a length of between 0.25 inch and 1 inch and a thickness equivalent to that of the starting material (about 0.075 inch). The confetti-like material was fed to a Munson rotary knife cutter, Model SC30. Model SC30 is equipped with four rotary blades, four fixed blades, and a discharge screen having 1/8 inch openings. The gap between the rotary and fixed blades was set to approximately 0.020 inch. The rotary knife cutter sheared the confetti-like pieces across the knife-edges, tearing the pieces apart and releasing a fibrous material at a rate of about one pound per hour. The fibrous material had a BET surface area of 0.9748 m2/g +/-0.0167 m2/g, a porosity of 89.0437 percent and a bulk density (@0.53 psia) of 0.1260 g/mL. An average length of the fibers was 1.141 mm and an average width of the fibers was 0.027 mm, giving an average L/D of 42:1. To saccharify the paper feedstock, first 7 liters of water was added to a vessel. The temperature of the water was maintained at 50°C throughout the saccharification process, and pH was maintained at 5. The feedstock was added to the water in increments, as shown in the table below. After each addition, mixing was performed until the feedstock was dispersed, after which a mixture of two enzymes was added, again as shown in the table below. (Enzyme 1 was Accellerase® 1500 enzyme complex. Enzyme 2 was Novozyme™ 188 cellobiase enzyme.) After each addition, mixing was initially performed at 10,000 RPM, with the mixer being turned down to 4,000 RPM as soon as the feedstock had been dispersed. An IKA Werks T-50 jet agitator mixer was used, with a 50K-G-45 jet mixing tool. The feedstock was added in increments because it was necessary to at least partially saccharify the feedstock before more could be added; otherwise the mixture became too difficult to mix. It was observed that less enzyme was needed to obtain a given glucose level than had been required in previous shake-flask experiments. No contamination by undesirable microorganisms such as mold was observed for the first 300 hours. At approximately 300 hours a mold-like organism was observed on the tank walls where sugar concentration was lowest, but not in the tank itself. * The 1600 gram addition was made over the course of several hours. For example, the jet mixers described herein can be used in any desired combination, and/or in combination with other types of mixers. The jet mixer(s) may be mounted in any desired position within the tank. With regard to shaft-mounted jet mixers, the shaft may be collinear with the center axis of the tank or may be offset therefrom. For example, if desired the tank may be provided with a centrally mounted mixer of a different type, e.g., a marine impeller or Rushton impeller, and a jet mixer may be mounted in another area of the tank either offset from the center axis or on the center axis. In the latter case one mixer can extend from the top of the tank while the other extends upward from the floor of the tank. In any of the jet mixing systems described herein, the flow of fluid (liquid and/or gas) through the jet mixer can be continuous or pulsed, or a combination of periods of continuous flow with intervals of pulsed flow. When the flow is pulsed, pulsing can be regular or irregular. In the latter case, the motor that drives the fluid flow can be programmed, for example to provide pulsed flow at intervals to prevent mixing from becoming "stuck." The frequency of pulsed flow can be, for example, from about 0.5 Hz to about 10 Hz, e.g., about 0.5 Hz, 0.75 Hz, 1.0 Hz, 2.0 Hz, 5 Hz, or 10 Hz. Pulsed flow can be provided by turning the motor on and off, and/or by providing a flow diverter that interrupts flow of the fluid. While tanks have been referred to herein, jet mixing may be used in any type of vessel or container, including lagoons, pools, ponds and the like. If the container in which mixing takes place is an in-ground structure such as a lagoon, it may be lined. The container may be covered, e.g., if it is outdoors, or uncovered. While biomass feedstocks have been described herein, other feedstocks and mixtures of biomass feedstocks with other feedstocks may be used. For example, some implementations may utilize mixtures of biomass feedstocks with hydrocarbon-containing feedstocks such as those disclosed in U.S. Provisional Application No. 61/226,877, filed July 20, 2009 , the full disclosure of which is incorporated by reference herein. saccharifying a biomass feedstock in a vessel by mixing the biomass feedstock with a fluid medium and a saccharifying agent using a jet mixer. 2. The method of claim 1 wherein the feedstock has a bulk density of less than about 0.5 g/cm3. 3. The method of claim 1 or claim 2 wherein the fluid medium comprises water. 4. The method of any of the above claims wherein the saccharifying agent comprises an enzyme. 5. The method of any of the above claims wherein the jet mixer comprises a jet-flow agitator, and wherein saccharifying the feedstock comprises agitating the feedstock with the jet-flow agitator. 6. The method of claim 5 wherein the jet-flow agitator comprises an impeller mounted at a distal end of a shaft, and a shroud surrounding the impeller. 7. The method of claim 5 or claim 6 wherein the jet mixer comprises a plurality of jet-flow agitators, each jet-flow agitator being configured to operate revcrsibly, pumping fluid towards the top of the vessel in a first mode, and towards the bottom of the vessel in a second mode. 8. The method of claim 7 wherein, during at least part of mixing all of the jet-flow agitators are operated in the first mode. 9. The method of claim 7 or claim 8 wherein, during at least part of mixing some of the jet-flow agitators are operated in the first mode and, at the same time, others are operated in the second mode. 10. The method of claim 7, further comprising adding a microorganism to the vessel and fermenting the saccharified feedstock, wherein during at least part of fermentation all of the jet-flow agitators are operated in the first mode. 11. The method of any of the above claims wherein the vessel has an arcuate bottom surface. 12. The method of any of the above claims wherein the jet mixer comprises a jet aeration type mixer having a delivery nozzle, and wherein saccharifying the feedstock comprises delivering a jet through the delivery nozzle. 13. The method of claim 12 wherein the jet mixer is operated without injecting air through the delivery nozzle. 14. The method of claim 12 wherein saccharifying comprises supplying a liquid to two inlet lines of the jet aeration type mixer. 15. The method of any of the above claims wherein the jet mixer comprises a suction chamber jet mixer. 16. The method of any of the above claims wherein the jet mixer comprises a nozzle in fluid communication with a first end of an ejector pipe, the first end of the ejector pipe being spaced from the nozzle, and the ejector pipe having a second end that is configured to emit a fluid jet. mixing each discrete increment of feedstock into the fluid medium with the jet mixer before adding another increment of feedstock. 18. The method of any of the above claims further comprising monitoring a glucose level of a mixture of the feedstock, the fluid medium and the saccharifying agent during operation of the jet mixer. 19. The method of any of the above claims further comprising adding additional feedstock and saccharifying agent to the vessel during saccharification. 20. The method of any of the above claims wherein the vessel comprises a tank. 21. The method of any of the above claims wherein the vessel comprises a tank of a rail car or a tanker truck. 22. The method of claim 21 wherein saccharification takes place partially or completely during transport of the mixture of feedstock, fluid medium and saccharifying agent. 23. The method of any of the above claims wherein the feedstock comprises a cellulosic or lignocellulosic material. 24. The method of claim 23 wherein the feedstock comprises paper. 25. The method of any of the above claims further comprising adding an emulsifier or surfactant to the mixture in the vessel. 26. The method of any of the above claims further comprising adding a microorganism to the vessel and fermenting the saccharified feedstock. saccharifying a biomass feedstock by operation of a mixer that produces generally toroidal flow within a vessel in which the biomass feedstock has been placed with a fluid medium and a saccharifying agent. 28. The method of claim 27 wherein the mixer is configured to limit any increase in the overall temperature of the fluid medium to less than 5°C over the course of mixing. converting a low molecular weight sugar to a product by mixing the low molecular weight sugar with a microorganism in a fluid medium, using a jet mixer. 30. The method of claim 29 wherein the fluid medium comprises water. 31. The method of claim 29 or claim 30 wherein the microorganism comprises yeast. 32. The method of any of claims 29-31 wherein the jet mixer comprises a jet-flow agitator, and wherein converting comprises agitating the feedstock with the jet-flow agitator. 33. The method of any of claims 29-32 wherein the jet mixer comprises a jet aeration type mixer having a delivery nozzle, and wherein saccharifying the feedstock comprises delivering a jet through the delivery nozzle. 34. The method of any of claims 29-33 wherein the jet mixer comprises a suction chamber jet mixer. a jet mixer having a nozzle disposed within the tank and configured to mix the delivered biomass feedstock and saccharifying agent. 36. The apparatus of claim 35 wherein the jet mixer further comprises a motor, and the apparatus further comprises a torque monitor that monitors torque of the motor during mixing, and/or an amp monitor that monitors the full load amperage of the motor. 37. The apparatus of claim 35 or claim 36 further comprising a controller that adjusts the operation of the feedstock delivery device and/or the saccharifying agent delivery device based on input from the torque monitor. 38. The apparatus of any of claims 35-37 wherein the jet mixer comprises a motor and the apparatus further comprises a variable frequency drive configured to adjust the speed of the motor. 39. The apparatus of any of claims 35-38 wherein the tank has an arcuate bottom surface. allowing the inoculated saccharified mixture to ferment in the vessel. 41. The method of claim 40 further comprising, during fermentation, transferring the contents of the vessel to a transport vessel and allowing fermentation to continue in the transport vessel. 42. The method of claim 40 or claim 41 further comprising agitating the contents of the vessel with a jet mixer during saccharification and fermentation. 43. The method of any of claims 40-42 further comprising monitoring the oxygen content and ethanol and/or sugar content of the fermenting mixture. a controller configured to adjust the oxygen content of the liquid, using the vent and oxygen source, in response to input from the oxygen monitor. 45. The fermentation system of claim 44 wherein the controller is configured to oxygenate the vessel at a rate of less than 0.2 vvm. 46. The fermentation system of claim 44 or claim 45 further comprising a fermentation monitor configured to monitor the sugar concentration and/or ethanol concentration of the liquid in the vessel; and a controller configured to stop fermentation based on input received from the fermentation monitor. 47. The fermentation system of claim 46 further comprising a fermentation stopping module configured to stop fermentation in response to a signal received from the controller. drawing slurry material from the vessel and jetting the slurry material into the vessel, while saccharifying at least a portion of the lignocellulosic material, producing a sugar. The method of claim 1, wherein jetting the slurry material comprises providing a jet mixer having a nozzle, and directing the slurry material through the nozzle under pressure. The method of claim 2, wherein a pump generates the pressure, the nozzle being in fluid communication with the pump. The method of claim 2, wherein the nozzle comprises a shroud surrounding an impeller, the impeller configured to provide jet flow through the nozzle. The method of claim 2, wherein the jet mixer directs slurry material in a first direction through a first end of a nozzle when operating in a first mode, and in a second direction through a second end of the nozzle when operating in a second mode. The method of claim 1, wherein jetting the slurry material comprises directing the slurry material through a plurality of nozzles under pressure, the pressure generated by one or more pumps, each of the plurality of nozzles being in fluid communication with at least one of the one or more pumps. The method of claim 1, wherein jetting the slurry material comprises drawing slurry material through an inlet to a pump, the inlet being in fluid communication with the vessel; and pumping the slurry material through a nozzle under pressure, the nozzle being in fluid communication with the pump. The method of claim 7, wherein the pump is located outside of the vessel. The method of claim 7, wherein the inlet draws slurry material from near the surface of the slurry in the vessel. The method of claim 7, wherein the inlet draws slurry material from near the bottom surface of the vessel. The method of claim 1, wherein the slurry material jets into the vessel through a nozzle at a velocity between 5 to 150 meters per second. The method of claim 1, wherein jetting the slurry material into the vessel causes a secondary entrained flow of aqueous slurry material in the vessel. The method of claim 1, wherein jetting the slurry material into the vessel provides effective mixing in the vessel while minimizing damage to the enzyme. The method of claim 1, wherein the vessel has a flat bottom surface. The method of claim 1, wherein the vessel has an arcuate bottom surface. The method of claim 1, wherein the vessel has a volume of at least 4,000 L.
The method of claim 1, wherein the vessel has a volume of at least 40,000 L.
The method of claim 1, wherein the initial solids concentration of the lignocellulosic material in the slurry is at least 20 weight percent, and wherein the lignocellulosic material comprises corn cob. The method of claim 1, wherein the lignocellulosic material has been exposed to irradiation, the irradiation provided by one or more of: an ion beam and an electron beam. The method of claim 19, wherein the lignocellulosic material has received at least at least 10 Mrad of irradiation. The method of claim 19, wherein the lignocellulosic material has received irradiation at a dose rate of at least 1 Mrad per second. The method of claim 1, wherein the lignocellulosic material has a bulk density of less than about 0.5 g/cm3. The method of claim 1, wherein the enzyme comprises a cellulase. The method of claim 1, further comprising fermenting at least a portion of the sugar with a microorganism. KENNETH S. KRANE: "Introductory Nuclear Physics", 1988, JOHN WILEY & SONS, INC.